Welcome to Day #10 Chocolate and Caramel Theme Week. 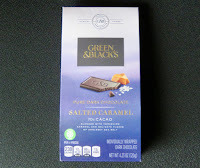 Today's package of individually-wrapped Green and Black's Pure Dark Chocolate Salted Caramel 70% Cacao (small bars) was distributed by Mondelez International LLC (East Hanover, NJ). 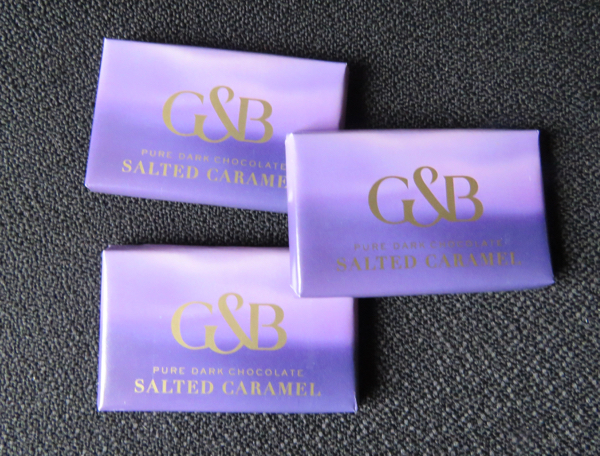 This truly international product started out with cacao grown in Africa,* Yorkshire Caramel and Anglesey Sea Salt. The small bars were made in Poland, and distributed by a large U.S.-based corporation. The 70% cacao dark chocolate base was smooth and had a pleasant browned butter/brown sugar (with a hint of malt) aroma. Flecks of caramel and flakes of sea salt added some texture. Good news. These small bars contained no artificial colors, flavors or preservatives. However, sadly (for a gluten-free person), they did contain wheat (glucose syrup, from wheat). Caramels made in Europe are more likely to contain glucose syrup, instead of corn syrup more frequently encountered in U.S. confections. *The company cites their involvement in the Cocoa Life program; cocoa is "hand-harvested from African small-holder farms."